Relaxation and Romance - experience a carriage ride through the powder snow. You will glide over pastures and fields surrounded by stunning mountain scenery through the winter landscape. 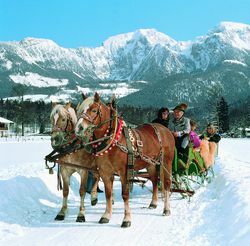 Sleigh rides to the deer-feeding area in Hirschbichltal are a particular highlight.